Polenta, the store cupboard staple most commonly associated with the peasant cuisine of Northern Italy, takes centre stage at La Polenteria, the new restaurant just opened in Soho’s Old Compton Street. La Polenteria aims to be a modern, different venue renown for rejuvenating polenta, by giving it a cosmopolitan and modern feel. It promotes and recreates polenta as a healthy, tasty, high quality dish loved by all, presented in a contemporary style. Polenta, or cornmeal, is served as a substitute for bread, pasta, rice or potatoes, but it is a grain naturally gluten-free. It draws its flavour primarily from the foods served with it, and it is used for everything from starters to desserts. Thus the imagination and taste buds hold the key to a good polenta, as reflected in the menu at La Polenteria. This is a mainstream restaurant, but because polenta is naturally gluten-free, it offers a great dining out option for those who are gluten intolerantWhat’s more, some of the dishes are suitable for vegans and vegetarians, thus also appealing to that market. Open seven days a week from 8 am to 11.00 pm, La Polenteria’s offers breakfast items such as Polenta Muffins, Creamy Polenta with Blueberry & Maple Syrup, or Raspberry & Mascarpone, and Polenta Cupcakes. The coffee is one of Italy’s best, the organic Chiaroscuro from Mokaflor, which combines the individual qualities of the best Arabicas in the world for a harmonious blend. The menu shows the vegan, vegetarian, fish and meat choices, and is printed on environmentally-friendly corn-paper. 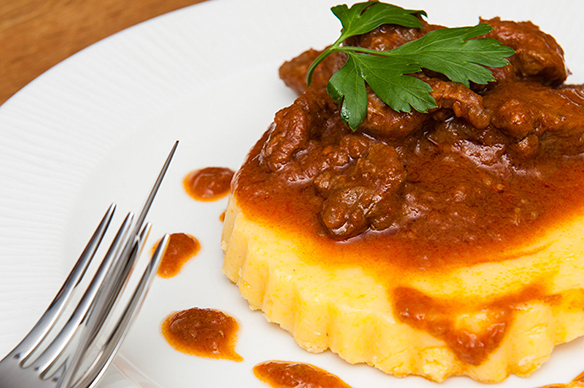 At lunch and dinner, La Polenteria offers dishes such as Polenta with Sicilian Caponata, Salt Cod, Gorgonzola & Walnuts, Wild Boar, Goulash and Tuscan Sausages with Borlotti Beans to quote a few of the choices, with an average spend of £15-£20 per head. It is worth pointing out that the sauces served with polenta are also gluten-free. Moorish sweet treats include an indulgent Muffin Rocher and a light and tasty Polenta Cake, and the distinctive, deep-flavoured, gluten-free Venchi chocolate from Turin, with bars starting at £1.20 to eat in or take away. Among the beverages, there is a gluten-free Golden Ale, a selection of quality Italian wines, soft drinks which are truly different, and great coffee. It is open seven days a week from 8 am to 11 pm and sits around 20 people in a mixture of tables and counter stools.